Since 2004 Mainline Menswear has been providing stylish designer clothing, footwear and accessories for men of all ages. Official stockists to some of the biggest designer labels, and with new products arriving daily, you're sure to find the freshest styles. With a brand portfolio including Armani Jeans, Hugo Boss, Diesel Jeans, Adidas Originals, Franklin and Marshall, Ralph Lauren, Superdry, Lyle and Scott, Pretty Green, Levis Jeans, Stone Island, CP Company, Paul Smith, Ted Baker, Lacoste Trainers, Fred Perry, Mens Timberland Boots, Luke 1977, Nike and more there’s plenty of designer pieces to choose from. Browse the extensive range of Mens Designer clothing. 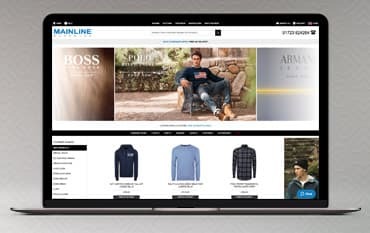 Whether you're looking for designer jeans, jackets, t-shirts, jumpers, shirts, shoes, footwear and trainers, socks, watches, flip flops, boxers, or swimwear, you can find it all, plus much more, in the clothing and footwear categories on the Mainline Menswear website. Shop via the bestseller category to find what’s most popular or check out the ‘new this week’ tab for all the latest trends straight off the catwalk. Shop by brand to find the exact product you have in mind from your favourite designer or check out the sale section for great offers on a huge array of stylish menswear. To match the impressive range of men's clothing, Mainline Menswear continuously strives for service excellence. By providing impeccable customer service not only do you get the best designer clothes but also peace of mind with every item you purchase on the Mainline Menswear website. All orders are dispatched using premium UK next day delivery to ensure your order gets to your right away, and if you have any issues the friendly customer service team are more than happy to guide you through every step of your shopping experience. Because of this excellent service and dedication to their customers, Mainline Menswear have earned a 4.8 out of 5 rating based on 40,136 customer reviews and counting! Therefore you can rest assured that you’ll receive the premium customer service you’re promised when you shop for affordable, designer men’s clothing at Mainline Menswear. In the Mainline Menswear final reductions sale, you can find all manner of men’s clothing, accessories and footwear with great percentage discounts. With items from brands like Emporio Armani, Boss Orange, Adidas, The North Face, Versace, Diesel, Vivienne Westwood and Barbour, clothing sizes that range from XS to 5XL and shoe sizes that range from 5-12, you are sure to find exactly what you’re looking for in the sale. Shop by brand, size, category and colour and find your ideal designer menswear at great affordable prices. In the Armani Jeans section, you can find men’s jeans, shirts, t-shirts, jumpers, zip up tops, coats and jackets, trousers, underwear, shoes, trainers and accessories. There’s also plenty of Armani Jeans’ products in the sale section at Mainline Menswear, check out the final reductions sale now to find these items at a discounted price. From jogging bottoms to man bags, to belts and long sleeve t-shirts, you can find all the clothing you could need from the Armani Jeans’ brand, for every season and occasion, all at affordable prices in multiple sizes. You have 14 days from the date you receive your delivery to return goods for an exchange or refund. Mainline Menswear do allow slightly longer for you to return items for an exchange or credit note. Please note they do not accept any items back after 30 days from the date the order is delivered. Mainline Menswear is one of the leading retailers of men's designer clothing, footwear, and accessories. If you are looking for affordable designer menswear from top men's fashion brands such as Armani, Hugo Boss, Pretty Green, Levis, Timberland, plus many more, then you are certainly in the right place. Shop with a Mainline Menswear discount code from us and save yourself some money when you next buy online too. You can also check out the sale section where there are tons of bargains and great price reductions.